Raleigh - Sixty years after the Korean War, one which some call the "forgotten" or "unknown" war, many US veterans gathered together on the anniversary recounting their experiences. For South Koreans who lived through it, the memories continue to haunt them. 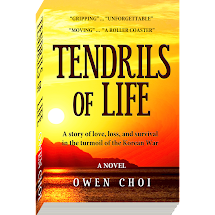 Digital Journal interviewed Owen Choi, author of Tendrils of Life, a book which exposes the personal side of the war revealing how the turmoil in Korea at the end of World War II and the Pacific War devastated the country and its people. In Choi's debut novel, he weaves the historical events through the eyes of his main characters as they struggle to survive the injustices and strife that war brings. 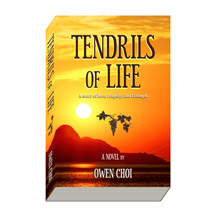 Digital Journal: Tell me something about your novel Tendrils of Life. 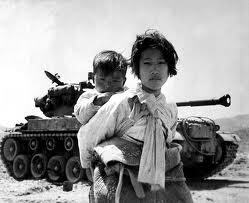 Owen Choi: Acute food shortages and lawlessness plague communist-occupied Seoul at the start of the Korean War in 1950. Jimin, a sixteen-year-old boy, aches to return to the safety of his old home on Ockdo (Jade Island), a remote island he'd left five years earlier. But only his father, who is absent from home, knows the way. His adversary, a man who's been plotting to wipe out Jimin's family and steal their island, murders Jimin's mother and tries to eliminate him, forcing him to traverse the war-torn country on foot with his seven-year-old sister to find his father. But the war sweeps across the country multiple times and hinders them from meeting up with their father. Back in Seoul, with Chinese troops (who invade the country to prop up the communists) bearing down on them, Jimin is forced to join the army, leaving his sister alone, hungry, and homeless in the cold, bomb-devastated city. During a long march, Jimin succumbs to hunger and fatigue and is left to die at a roadside house. He is rescued by a girl he loves, but the war, his adversary, and personal misfortunes continue to thwart his goal of returning to his island with his girl, father, and sister. He miraculously survives a massacre and an epidemic of relapsing fever and undergoes other gut-wrenching trials. He finally stumbles on his father, who is very ill with tuberculosis, and he must overcome formidable obstacles to return to Ockdo. 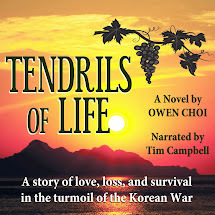 With action and suspense, Tendrils of Life is a rich and intriguing upmarket fiction, interwoven with gripping character-oriented narratives and full of visual detail. It's a story of love and hope, greed and revenge, and the quest for survival in the turmoil of war - a depiction of resilience of the human spirit. Digital Journal: What genres would Tendrils of Life fall under? Digital Journal: What kind of readers will it appeal to? Owen Choi: Readers who want to read a real-life story. Readers who enjoy literary fiction. Readers who want to be transported into the world the book presents. Readers who want to identify with sympathetic characters. Readers who want to be emotionally touched. Readers who want to understand a different world and culture, as well as how war affects human lives. Owen Choi: I was a child during the Korean War and my family was heavily impacted by it. And I always wanted to write about that time and studied fiction writing, reading tons of literary fiction (mainly American and British novels). For many years I collected data and tried to recollect my childhood memories as well as my lifetime experiences; these are indirectly reflected in the novel. The main characters are fictitious, but some minor characters were derived from my relatives. Many people who have read my book think it is written from my heart; others think it is my personal biography despite the fact that I am too young to be the main character. Digital Journal: Please share your favorite excerpt from the book. Owen Choi: They entered the plot through an opening behind the house and looked at the grapevine. There were some dead stems, but one of them had survived and was standing knee high among the weeds, swaying in the wind without any support. Digital Journal: Tell us about yourself. Owen Choi: I was born in South Korea, and came to the United States in 1972. I worked in various fields of computer software, most notably in computer networking, and took an early retirement from a technical leadership position at IBM. I now devote my time to writing my second novel. Although I studied engineering and became an engineer, writing fiction was always my passion from my childhood days, inspired by the works of Hemingway, Steinbeck, and others. Digital Journal: What is your marketing strategy for your book? Owen Choi: I plan to stay with Amazon's KDP Select. The free promotion helps expose my book to people. Digital Journal: If you were given one wish to make a change in the world, what would it be? Owen Choi: I would wish for a world without wars. Digital Journal: Do you have anything you would like to say to Digital Journal readers? Owen Choi: Readers are the masters and authors are servants. What can a servant say to the master? Digital Journal: What is next for you? Owen Choi: I am writing a second novel. But it will take time because I always strive for perfection. War, love, and formidable obstacles for survival. Many passages in Tendrils of Life exude memorable scenes, characters, and actions; the following questions may lead you to reflect on some of them. 1. The many trials Jimin goes through should have brought some significant changes to his character. Can you think of some ways he has changed? Are they the right kinds of changes? What are the key events that caused those changes? 2. One of the major decisions Jimin makes is going back to Seoul to find Sora and his father, and allowing his little sister to tag along in spite of himself. Had he decided to stay at Hadong, he would have met his father the next spring and set sail to Ockdo. Assuming that he believes it is the right decision, do you think Jimin could have been patient enough to wait, suppressing the desire to see Sora? 3. What does Jimin's gut-wrenching separation from his sister bring him? Suppose Misern stays in the relative safety of her father's hometown when Jimin is forced into the militia. Would it make a big difference for his endurance and perhaps alter the course of action that follows? Would it change the odds of his survival? 4. Without his thirst to return to Ockdo, could Jimin have survived? What role does the seashell he carries around play in the story? How about the sunset and the sound of the waves? 5. What do you think of Iodo in this book? In your opinion, does it further the story or enrich it in some way? Is it possible that Ockdo and Iodo gradually become the same island in Jimin's mind? 6. Toward the end of the book, Jimin could have stayed with Unhee rather than go out to sea to find Iodo or an island similar to Ockdo. Do you think the former is the more rational choice for him to make? Is it likely that (after the story's end) Jimin came back to see her and perhaps search for her? Had Unhee not moved away, might he have taken her and her daughter to his island? 7. For nearly five days while Jimin stays at her place, Sora pretends that she doesn't know Jimin. Would you do the same if you were in her place? 8. Sora doesn't tell Jimin the truth about Misern's whereabouts when she returns from the trip to Seoul to find her. Would you handle the situation differently? What might have happened if she told him the truth? 9. Sora gradually changes her mind about Sinman and entrusts herself to him in order to survive. Do you see this as weakness on her part or an inevitability given the circumstances? 10. Do you think Sinman could have been a likable character? Would he have become a good person if he had grown up in an ordi-nary environment? 11. What do you think of the scene where Sora is killed? Do you think Jimin acted properly in that scene? 12. The author reveals in the Epilogue that Misern had survived the war. But he only hints at the possibility, if strongly, that Jimin and Misern have been reunited. What do you think about this? Do you think the author intentionally left it vague so that the reader could decide? Can you make up your own story about how she survives and how she and Jimin stumble upon each other? 13. Do you think the ending of the story is tragic, happy, or both? How would you end the story if you were the author? 14. Jimin yearns for his island all the time while he is away from it. After he returns to Ockdo, do you think he would miss the places he had been during those six years on the mainland and the people he had stayed with? Would he have gone back many times, searching for his little sister and looking back on those difficult years? 15. The division of Korea into North and South was proposed by the United States when the Soviet Union entered the Pacific War by invading Japanese-occupied Manchuria two days after Hiroshima. The U.S. dropped another atomic bomb just a day after the Russian invasion. And Japan surrendered within a week. It would have been more logical had the U.S. instead proposed a buffer along the border between Korea and Manchuria. There would have been no Korean War in that situation. Do you believe a war between the communist bloc and the free world would have occurred anyway? Could it have developed into another global conflict, unlike the Korean War which was contained inside Korea? 16. Had America decided not to act against the North Korean in-vasion in June 1950, the communists would have won a quick victory in less than two months. The cost of the war would have been much smaller, with far fewer casualties. On the other hand, it would have emboldened Stalin and his followers and could have turned the cold war hot. Do you think U.S. involvement in the Korean War (as well as other nations' participation) has made the world a safer place to live? 17. One of the reviews of the book includes this statement: "Amer-ican soldiers are depicted quite poorly here; they speak of their disdain for the country that they are risking their lives for." Given that these first waves of U.S. soldiers-part of the peacekeeping force in Japan who had never expected to be involved in a war-were suddenly thrown onto a battlefield, vastly outnumbered, suffering defeat after defeat and retreating, do you consider their disdain and paranoia unrealistic? The author says that the U.S. military operations described in the book largely came from various U.S. sources. He says that the soldiers of the Soviet Union, when they occupied North Korea in 1945, stole personal belongings such as wristwatches from pedestrians and raped women in front of their families even in big cities, and that one must look at things from the worldview of the 1950s rather than from today's perspectives, in which hideous images can be transmitted instantly around the globe. Do you think the author was one-sided or intentionally criticized American soldiers? These are all superb questions. All of them address individual personality characteristics that respond in predictable and totally unpredictably ways when war(s) begin(s). Each character must decide what motivations evolve into specific actions, sometimes making sense immediately, sometimes later, and more often than not never at all. Still the questions above should stimulate questions that must be asked about historical realities. Have we not all heard the saying that unless we study history it shall repeat itself? It shall and it does. These are great questions for book clubs to discuss and for leaders to ponder, even without the light of public media monitoring responses. Again, this is a powerful novel worthy of recognition and reflection.